PUTNEY, VT—October 4, 2018—A gathering of current and past Putney Craft Tour members will celebrate the tour’s fortieth year on October 24th at 7pm at the Putney Public Library. Along with friends and neighbors, stories and memorabilia from the fascinating early years of the tour to the present will be shared. Over 100 artisans and artists have been part of the tour and many will be at the library celebration reminiscing about the life of the tour and their own personal stories, including craft tour members Ian and Jenny Eddy (decorative, functional, hand wrought iron), Carlene Raper (beautiful hand-dyed cotton fabrics, quilts, pillows), Wendy Wilson (wood turned bowls and wooden toys), Carol Keiser (art tiles), Liz de Niord (clay and paint), and Bob Burch (glassblowing). The evening will be full of reflections and memories that will help build an oral history of craft in our area. In the tradition of welcoming the public into the studios, cider and refreshments will be served. A sampling of craft and memorabilia including old posters and brochures will be on display. The artists had been there, drawn into creative orbit in and around Putney in the late-1960s and early-70s for many reasons, including the back-to-the-land movement, the rise of American craft and the powerful cluster of creative souls brought there by Windham College, the Yellow Barn Music Festival, The Putney School and the Experiment in International Living. Some of those crafters were the ones local woodcut artist and business owner Margot Torrey gathered around her table in 1978 to discuss plans for the Putney Artisans Festival. In truth, Torrey wasn’t the only person to see the value in this. The Mischke, Carol Keiser and the Eddys had already been welcoming people to their studios, growing their customer base right where they worked. A former teacher, Torrey saw the educational value in bringing people right to the studios. She kept bringing the local artisans to her dining room table, and the idea of the Putney Craft Tour was born from the Putney Artisans Festival. In 1982, on the fourth annual tour there were 16 artisans working in 13 studios. The tour was advertised as the Annual Holiday Craft Tour, Open House and Seconds Sale, and the practice of going from studio to studio or ‘over the river and through the woods’ was established, inviting the public into the space where work is created to learn about the craft and talk to the person who made it. 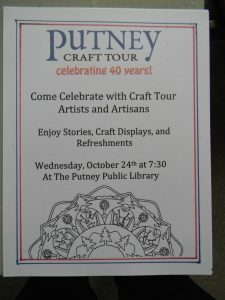 The Putney Craft Tour, though unique at the time and distinct to this day, did not spring out of a vacuum, but from the happy confluence of a number of trends. No doubt, Vermont’s agrarian heritage created a culture of craft and an appreciation of the hand-made, which remains to this day. More to the point, Vermont was at the forefront of discussions championing craft as art. In 1938, Aileen Osborne Webb invited artisans and groups with a vested interest in crafts to a meeting in Shelburne, VT. By the end of their three days together, they had agreed to form the Handcraft Cooperative League of America, the first national organization of craft. That organization would evolve to become the American Craft Council. “It can be argued that Vermont served as the birthplace of the modern American craft movement,” wrote Jamie Franklin and Anne Majusiak, curators of “State of Craft,” an 2010 exhibit at the Bennington Museum. In the cultural foment of the ’60s and ’70s, impulses toward self-sufficiency and back-to-the-land fused with rejections of the industrial and the artificial, further feeding the supply of artisans who came to Vermont’s quiet towns and back roads to live and work. The Putney Craft Tour is the oldest continuing crafts studio tour in North America and has served as a prototype for tours all over the country. It was a model for the Vermont Crafts Council when it put together its own statewide tours. This year’s tour, a Top Ten Vermont Winter Event, will take place on Thanksgiving Weekend, November 23, 24, 25. The tour includes 25 working studios that feature glass blowers, potters, jewelers, weavers, woodworkers, photographers – even artisan cheesemakers and bicycle makers. Part of the fun is meandering through the beautiful Vermont countryside, following the map to find these prominent craftspeople and view the works where they are conceived and created.